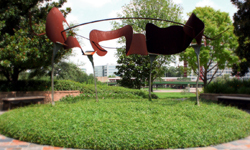 Near the parking area in Eleanor Tinsley Park and in view of Allen Parkway traffic, shaded by park trees, the Victim Memorial called Shady Grove stands as a collection of interconnected metal sculptures. 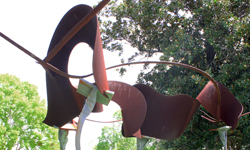 They take the form of trees in permanent, impervious metal and suggest the connections between the victims of crime and the support groups in Houston dedicated to helping them. Pavers in the ground are dedicated to those victim service organizations. Shady Grove was created by Tim Bailey.